Palestinian critically injured by settler during attack on a bus. 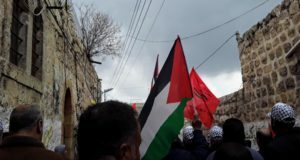 On Monday, June 1st, settlers from the Havat Gilad settler outpost in the Qalqiliya district of the West Bank reportedly attacked a minibus transporting 17 Palestinians to their jobs in Israel, critically injuring one. The settlers later burned an estimated 100 dunams of Palestinian land, leaving scorched earth and trees. At approximately 4:30 a.m. on Monday a busload of 17 Palestinian men, mostly young and all with Israeli work permits, was stopped on the road near the entrance to Qedumim settlement by an estimated 50 settlers, who proceeded to throw rocks at the vehicle. Four workers were injured, one critically, and he remains in hospital. The workers said Israeli soldiers were just 50 metres away from the settlers at the time of the attack. However, they reported, the soldiers did nothing to stop the settlers, nor did they take subsequent action. 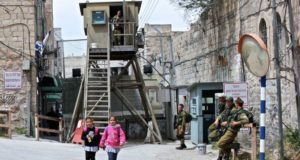 One uninjured worker asked soldiers to call an ambulance, but, he reported, they refused and even threatened to shoot him if he did not leave the area, which they had declared a closed military zone. At around midday the settlers proceeded to burn Palestinian farmland, estimated by Nasser Sedda, the mayor of Jit, to cover 100 dunams and belong to eleven local families. Some of the land was planted with olive trees and with wheat, and an estimated 100 trees were destroyed in the fire. The Israeli army prevented farmers from reaching their land after the fires were set, the mayor reported, and consequently they were not able to extinguish the flames until between 4 and 5 p.m., by which time the damage was extensive. 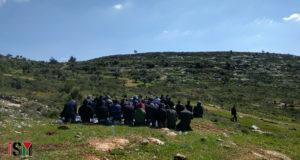 One farmer with land near the neighbouring village of Immatin said that during last autumn’s olive harvest settlers from Havat Gilad burnt trees on his land. Four dunams of land had also been taken from the 17 dunams he owns for the construction of the outpost, and olive trees destroyed.